It's THAT time of year again...... You know, when all the passions start to stir! Even though I lost my dangly bits ages ago, I still get excited, and like to fuss around Flopsy Girl even more than ever! Of course things don't always turn out for the best. Take my young friends Gin & Tonic for example. 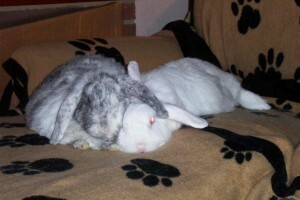 They have started to fight, just in case a nice girlybun puts in an appearance! Tonic is definitely in a strange mood. Our 2-foots think it is because he can smell our mummy and auntie in the neighbour's garden.